Six years ago I wrote the Halifax College website when I sat on the college committee. Since then, I have left the University of York and gained a degree at another university but throughout that time my old website has been kept in use, different content, different webmaster, but still the same design and code. This week sees the launch of a new site in it’s entirety, code, design the works. The site is still hosted on my server which is why you will see a link to this blog on the bottom of the site but apart from that it’s now entirely out of my hands. In some way I’m sad to see it change but 6 years is a very good run for a site design/back-end without any changes and it was only right that full control should pass from the hands of an old alumni into fresh ownership, after all I think you’ll agree that the new look is rather pleasing to the eye. Anyone interested in what the site used to look like when I ran it, can check it’s internet archive entry. Halifax Online is dead, long live Halifax Online! I was in a sweet shop in York last weekend (I have a sweet tooth, I just can’t resist) and I overheard someone say that the traditional sherbet fountains are going to be removed from sale in the near future for “health and safety reasons”. This is apparently despite acknowledgements from all parties concerned that no harm has ever come to anyone through the fact the liquorice is open to the air. Day by day I hear of more ludicrous actions being taken in the name of health and safety which merely seem to reduce our enjoyment of life. 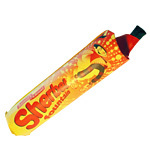 Sherbet fountains have been around my entire life and I remember buying them as a child. Not only that but my parents remember buying them as children. Bureaucrats and paranoid health officials shouldn’t be allowed to meddle. So following on from my last debacle with Swindon Borough Council concerning parking, I figured I would have more luck getting a visitors permit for my parents to park outside my house for the day. After all, I’d already gone through the agony of getting a residents permit for myself (which involved queuing for an hour and presenting 2 forms of id and the registration details of my car) so my details were already on the system with a valid permit. How wrong I was though. When I arrived in the council offices this morning it was all very quiet and I got straight to the parking services desk. That’s about the only thing that went well. I asked them for a visitors permit and gave my current details which they pulled up on the computer. They then said that although I was entitled to a visitors permit, they wouldn’t give me one unless I gave them a bank statement. I replied that I didn’t have one with me and besides, they already knew I lived at the address and that I had my own car parked there so what was the problem. They said, and get this, “people who rent move out all the time and so we have to check the permit holder still lives there first”. Well to debunk their reasoning. Firstly, I’ve hardly ever seen a housing contract that doesn’t last for at least 6 months. Secondly, the council won’t give you a permit that lasts more than 6 months if you rent. Deduction; I couldn’t possibly have a parking permit with 3 months left on it if I wasn’t still paying rent on the house the permit is registered to, ergo, I must still live there, or be foolishly throwing money down the drain on a property I don’t live in, but either way, still entitled to permits for guests. To be honest I’m not surprised that people move out all the time when the council treats them like that, after all, not all councils around the country are tight fisted enough to make you pay to park outside your own house let alone prohibit your guests from doing so through a pointless bureaucratic process. Anyone would think I’d asked to park outside of Buckingham Palace, not down some random street in a railway town in Wiltshire. The other day I received a complaint concerning one of my domain names due to “inaccurate contact details being shown on the WHOIS”. The issue, or should I say non-issue seemed to be that some clever chap had noticed that the phone number I had displayed alongside my Swindon address was a Leeds one and thus had decided that one or other of the pieces of information must be bogus. Still, to appease the burocrats at ICANN I have now changed the number to a non-geographic 0845 number. This will sadly increase the cost for anyone calling but when certain individuals insist on making spurious claims, what else can a legitimate domain owner do?